I made crème brulee for dinner yesterday and got some leftover egg whites. These four leftover egg whites got me thinking of what and how I should do with them. That’s a good problem for me though. Having seen the classic Australian dessert, Pavlov made by Donna Hay on MasterChef Australia, I was aspiring to bake one very soon. 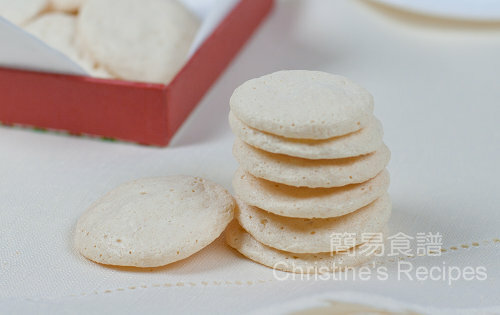 Quickly, I changed my mind without any reason and decided to make some mini almond meringues for the coming Mother’s Day. 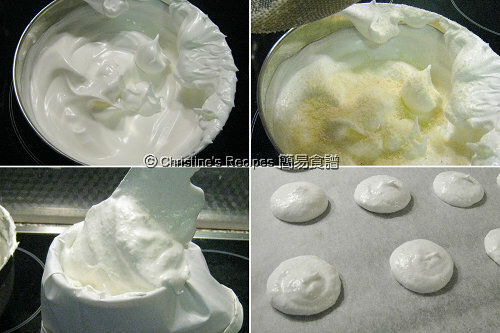 These meringues can be kept in an air-tight container for quite a long time, or if they turn soft outside, just pop them in the oven and heat them to dry again. 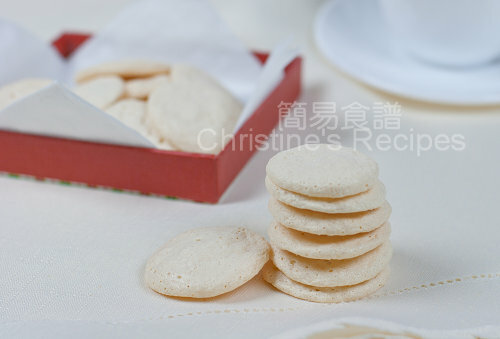 There are many variations you can make, for example, spread some chocolate cream between two mini meringues or simply sprinkle a bit of coco powder over the surface of meringues to your liking. It’ll be a great looking present for your mother. Sweet ! Prepare oven to 180C (356F). After 10 minutes, reduce the temperature to 90C (195F). Prepare 2 large baking trays lined with non-stick baking paper. In a large clean, stainless steel or glass bowl, beat egg whites with an electric mixer. (Note: make sure that your eggs are free from any water and oil. It’s very difficult to beat the egg whites and produce a good volume otherwise.) Start with the low speed of your mixer. When many bubbles form, add cream of tartar and continue to beat. When the egg whites turn white and increase in volume. Add 1/3 of sugar at a time. You don’t need to worry whether the sugar is beaten well after each addition. After adding the last batch of sugar, increase speed to high, continue to beat the egg whites until peaks form. When the mixture becomes very thick and glossy (as the picture shown above), all the sugar has dissolved, it’s done. You can test it by lifting up the beater, there should be a long trailing peak forms at the end of the whisk. Before beating egg whites, make sure the utensils are clean, free from any water or oil. It’s very crucial if you want to beat egg whites successfully. You can omit the almond meal if you want to. When you fold the almond meal into the fluffy egg whites, make sure to incorporate the ingredients gently without deflating all the bubbles of whisked egg whites. Don’t even stir it. Just scrape the egg whites from the bottom and turn them up on the surface. Repeat the folding with a quick but a gentle motion until all ingredients are just combined. I love them. Light, nutty, chewy and delicious. I'm sure this is a hearty present for any one. 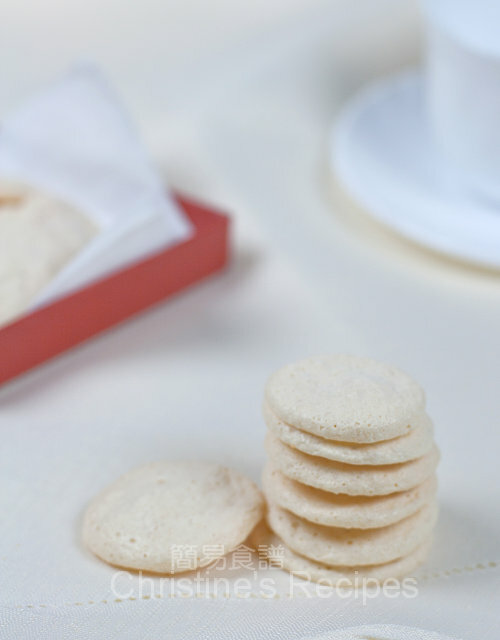 No offense, I was calling them white cookies by heart : ). This is a sweet dessert for moms.....Happy Mother's Day! These are just lovely! The almond flavor is terrific! Such a lovely pressie. Even I want it! these look so airy and light! Do they taste like macarons? I was looking for a simple recipe for macarons to try and found this. I do not have cream of tartar. Can I replace this with something else, like lemon juice? You may replace the cream of tartar with 2 tsp of lemon juice. But the almond meal can't be omitted for this recipe. Thanks Christine, for the reply. I tried the recipe. After I had put all sugar into the egg white and continue to beat, I noticed that the more I beat, the more diluted it became. Initially there was still some soft peak, but it became watery when I continued to beat more. I used a hand beat. Any idea what went wrong? The beaten egg whites tend to fall apart so that's why we have to add some acid, like cream of tartar of lemon juice to stabilize them. Are you very sure your beaten egg whites separated when they reached soft peak stage, and not stiff peak stage? Egg whites could be over-beaten, after they reach stiff peak stage but continue beating, as a result they will break down the structure.